My to-do list of all the tasks that I want to get done throughout the day seems to get longer rather than shorter as the day goes on. Maybe I bite off more than I can chew.. or my personal favourite 'I am a creative mind, producing endless ideas and possibilities' or something along those lines. I have always been this way. I think of new ideas and have to see them through, so they are added to my 'to-do list'. To be more productive, I needed to come up with a plan. I decided to find ways of getting more things done in the day. Which of course, I wanted to share with you all.. how kind of me. PRIORITIZE | Start with your most important projects or tasks on your list and work your way through them first. SET A TIME FRAME | Give yourself deadlines! Put pressure on yourself to complete your tasks at hand. WAKE UP ONE HOUR EARLIER | Now, if you are an early bird already, this may be unrealistic for you. However, if you wake up one hour earlier you can spend that time preparing the day ahead. CREATE A ROUTINE | Once you have established your set goals, sticking to a daily routine will help you prioritize and organise your life. PUT YOUR PHONE ON SILENT | Stop distracting yourself. By turning your phone on silent, even if it's for an hour, you will see results. 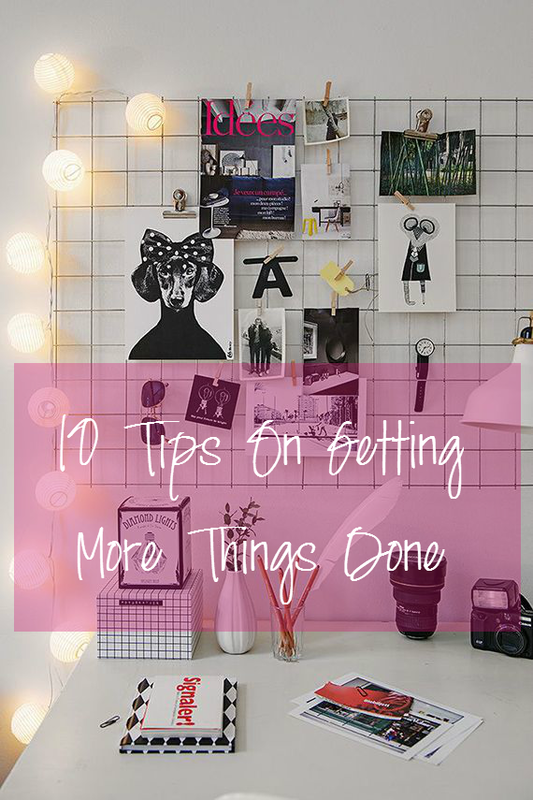 BRAINSTORM | If there are certain tasks on your list you need to accomplish first. Create a mind map of you ideas, however small. This will kick-start your planning and help you to organise your work. HEALTHY BREAKFAST | In fact, eating breakfast full stop will give you the energy you need to kick start your day! KEEP A PEN AND PAPER TO HAND | If you ever find yourself on public transport, or waiting around, use that time to make notes and get some of you creative tasks done. DE-CLUTTER | Get rid of any distractions around you. Turn off your TV, Social Media and just focus on what you need to get done. Make space around you. Clean space, free mind. SLEEP | I can't emphasis this enough. If you have a good night sleep, you will feel refreshed to start the day and get your jobs done! Make sure you clear your mind before you sleep so you're not distracted before bed.